EKF’s Beta-Hydroxybutyrate LiquiColor® assay for detection of predominant ketone body is now available on Ortho’s VITROS® 4600 Chemistry System and VITROS® 5600 Integrated System. Ortho Clinical Diagnostics (Ortho), a global leader of in vitro diagnostics, and EKF Diagnostics (EKF) today announced an agreement that allows Ortho customers to access to Beta-Hydroxybutyrate (BHB) assay, an important marker used in conjunction with clinical findings and other lab tests for the diagnosis and management of ketoacidosis and its main causative factor, diabetic ketoacidosis (DKA). The high-quality, fully automated assay is now available for use on Ortho’s VITROS® 4600 Chemistry System and the VITROS® 5600 Integrated System. Diabetic ketoacidosis is a serious complication that can lead to a disruption of chemical balance in the body, and can be fatal if left undiagnosed. EKF’s enzymatic Beta-Hydroxybutyrate (BHB) assay is used primarily for determining both the presence and degree of ketosis in suspected diabetic ketoacidosis cases. 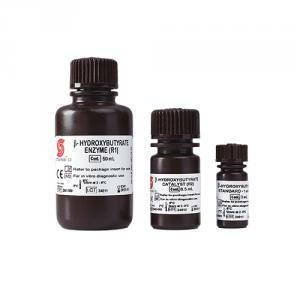 The BHB assay produces a quantitative value that is specific to the BHB ‘ketone body’. These qualities make the BHB assay the new clinical diagnostic standard of care for ketone testing. “Ortho is committed to delivering a broad menu of assays to our customers in the clinical lab, whether through in- house development or collaborations like the one with EKF,” said Ortho’s chief Operating Officer Robert Yates. Ortho and EKF are collaborating to provide the BHB assay as a validated MicroTip Partnership Assay (MPA) application in the U.S. and Canada. This MPA utilizes the User Defined Assay (UDA) feature, which provides the capability to program assay parameters as defined in the EKF- Stanbio Assay Application Sheet. The Beta-Hydroxybutyrate LiquiColor® assay has been CLIA classified by the U.S. Food and Drug Administration (FDA) as a MODERATE complexity assay on the VITROS® 4600 Chemistry System and VITROS® 5600 Integrated System. Currently this new MPA will only be available on the Ortho analyzers in the USA and Canadian markets. “Diabetic ketoacidosis is a serious condition, and our collaboration with Ortho Clinical Diagnostics will help to deliver the important BHB assay to their existing customers” said EKF’s Diagnostics Head of Sales, Gilbert Mejia. EKF Diagnostics’ Stanbio Chemistry portfolio is a broad range of liquid-stable reagents, calibrators, standards and controls. LiquiColor® and Liqui-UV® reagents are designed for maximum stability, ease-of-use and are optimized for today’s chemistry analyzers. In addition to its BHB test for ketosis, EKF continues to build on its successful range of esoteric reagents.